Last month I was in Csorna and I have taken two photos (see: here and here) of the flag of GySEV (Gy�r - Sopron - Ebenfurth Vas�t Rt., or ROeEE (Raab-Oedenburg-Ebenfurth Eisenbahn). 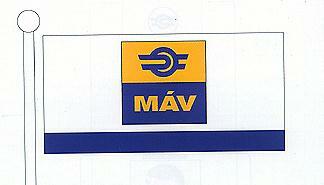 This private Railway Corporation is located in Hungary and Austria. It has got two lines: the Gy�r-Sopron-Ebenfurth line and the Fert�szen tmikl�s-Pamhagen-Neusiedl am See line. The flag, which I saw is a vertical only flag. Colours are: Yellow and green. In the 1/3 part of the flag there is the blue symbol of the GYSEV. Gysev homepage is <www.gysev.hu>. Here is the horizontal and vertical versions from the original official railways design-book. the flag below is NOT the original official railways flag! 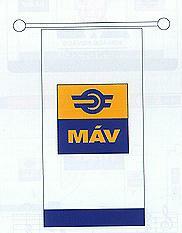 This is the old M�V flags, you could see these on the buildings of the stations, but there aren't official from 1999. I have seen this flag in the Hortob�gy National Park. In the white field there is the symbol of the HNP. Is it official? I don't know. The background of the flag contains the three Hungarian national colours, with gold braiding on the edges. One side of the flag is the same as the national flag (the coat of arms with the crown on a red, white and green background). The only difference is that the name of the school is embroidered with golden thread around the coat of arms with the crown. On the red background on the left side of the coat of arms the name Puskas is written and on the right side Tivadar. On the lower green background Tavkozlesi Technikum is embroidered also in gold. On the other side of the flag the name Tivadar Puskas, the person giving his name to the school, is embroidered with gold on the red background, and on the lower green background Tavkozlesi Technikum is written. In the middle of the flag there is the shield of the school. On the left side the date of establishing the school (1912-1913) and on the right side the year of the dedication of the flag (1952-93) is written also in gold. The stick holding the flag of the school is red, white and green striped. The flag is made out of silk. Description of the shield of the school: On the white ribbon with a golden edge above the shield the name of Tivadar Puskas is written in gold letters. The outer curve of the shield is wine coloured with a golden edge. On this curve Tavkozlesi Technikum is written in a circle. In the middle of the shield black and gold pictures are painted on the grey background which symbolise the main activities of the school: a telephone receiver, a radio aerial, an electric tube, a power line with insulation. Below the pictures there is an open book with pictures symbolising the subjects. K�zleked�studom�nyi Egyes�let - Hungarian Scientific Association for Transport. 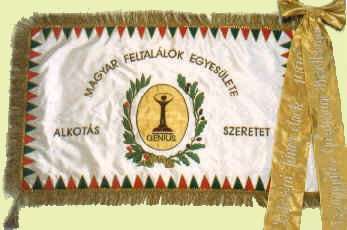 "The Association of Hungarian Inventors The Association of Hungarian Inventors (MAFE) was refounded in 1989. Between 1945 and 1989 the inventors in Hungary did not have any organisation. The Association is a member of the International Federation of Inventors' Associations (IFIA). MAFE has five thousands member."